After departing from Oak Ridge, Brian and I decided to take Highway 62 from Oliver Springs to Clarkrange, where we then opted to drive south towards Crossville and join back up with I-40 so we could grab a bite to eat and get home quickly. However, we made several side trips on the way home in order to see Brushy Mountain prison, Frozen Head State Natural Area, the Obed National Scenic River, and Bee Rock. Ever since I was a kid, I've had a strange fascination with places associated with deviant behaviors: prisons, abandoned mental hospitals, battlefields, crime scenes, etc. I suppose I feel that these places hold a special energy that always makes me feel uneasy and a bit agitated at the same time. In simpler terms, these places put me on edge and make me really feel alive. That's why I felt so compelled to see Brushy Mountain state Prison located in a remote valley of Morgan County. Brushy Mountain State Penitentiary first opened in 1896 to house prisoners previously used as convict laborers in the nearby coal mines. It held some of the state's most dangerous prisoners, including James Earl Ray who assasinated Martin Luther King, Jr. He and six other prisoners escaped for four days in 1977, but were eventually found and hauled back. Considering that Brushy Mountain sits in a cove directly surrounded by mountains, its a wonder anyone escaped at all. Just this year, Brushy Mountain closed its doors to prisoners after operating for 113 years. After Brushy Mountain, we drove on to Frozen Head State Natural Area where we hiked a short stretch of Panther Trail branch to see a waterfall. 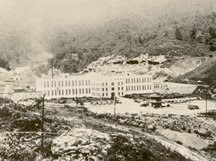 According to their visitor's brochure, Frozen Head was originally acquired as part of Brushy Mountain State Prison so that convicts could deep mine coal and harvest trees to supply timbers for the mine. The land was then transferred to the State Parks system in 1970 and features several hiking trails. Next, we drove through historic Wartburg and on to the wild and scenic Obed River where pioneers used to fish and trap game. The Obed is overseen by the National Park Service and features difficult Class II to Class IV rapids. My goal is to kayak the Obed one day, but my ability probably stops around Class II. Leaving the Obed, we drove through continuous pastures dotted with oil rigs on the Cumberland Plateau. Here we exited Highway 62 and rejoined I-40 where we took one last detour to Bee Rock in Monterey, TN. I went to college near Monterey, and Bee Rock was a favorite spot of local adventurers who repelled off the cliffs overlooking the unspoiled valley carved by the Calfkiller River.